Find hotel near Athenaeum De La Vigne Et .. This is a lovely wine shop that also has a very good collection of wine glasses, crockeries, journals, magazines, cards and other things all about wine. This is a wine lovers’ ultimate destination where he is sure to find everything he wants. They stock a wide range of wine varieties and also delicious snacks and savories. How popular is Athenaeum De La Vigne Et Du Vin? People normally club together Musee De L'hotel Dieu and Musee Du Vin De Bourgogne while planning their visit to Athenaeum De La Vigne Et Du Vin. Great wine tasting. We initially agreed on the 3-wine tasting, but ended up tasting almost 10 I think. They helped us to choose most of them from their selection, and they were amazing. We didn't have to pay for the tasting because we bought some bottles afterwards. I highly recommend, friendly service and a great selection of wines. 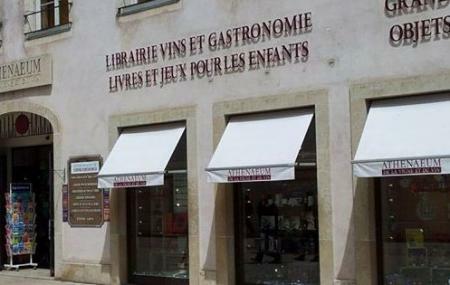 Best selection of Burgundy books (in French and English) and great wine maps for famous appellations. This place also has multitudes of wine gadgets, high end corkscrews, a wine shop, and other kind of books. This was a great stop in Beaune! Wines directly from prestigious and carefully chosen wineries, professional! Bookshop and wine merchant in one. Very nice place with good Burgundy. This is a store that surprised me. I went in for a book and came out with many more stuff. They have home decoration, many many books and maps and everything you want concerning wine very nice gifts to buy.